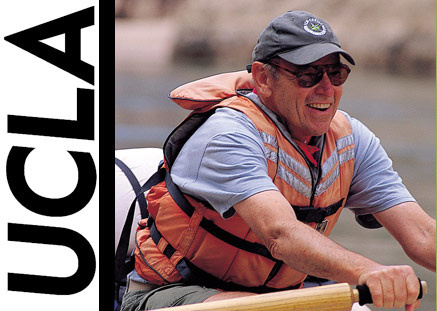 Shortly before graduation, George Wendt rafted through Glen Canyon on the Colorado River with the Bruin Mountaineers. The history major became a public school teacher after receiving his degree, but that trip inspired him to start OARS (Outdoor Adventure River Specialists) in 1969 to share his passion for whitewater rafting. OARS is now the largest river-based adventure travel company in North America. He shares his insights on how to turn doing what you love into a successful business — on and off the water. The transition from teaching to a full-time job involving river-running was fairly seamless. My wife and I had been conducting a small number of river trips for several years before we both quit our jobs to operate OARS. Even before we started actively promoting our new business, friends and friends of friends had been seeking us out. This gave us the confidence to try operating our new business, which had already developed some momentum, full time. To date, OARS has guides more than 500,000 guests on rivers and coastlines throughout California, the western U.S., and worldwide, and our goal is always to exceed their expectations. Our commitment to providing a great trip for everyone also provides a positive return for us in repeat passengers and in good word-of-mouth that is much more cost-efficient then traditional advertising. We encourage our frontline employees and passengers to submit posts — particularly photos, videos and stories — on our Facebook and other social media sites. This helps us build a community of loyal ambassadors who we know play an active role in promoting OARS throughout our media channels and through their own social networks. We have also found that our guides and passengers alike enjoy sharing (and in some cases, bragging about) experiences from their adventures with friends and colleagues. For example, a recent photo album posted from our Yellowstone and Grand Teton national park trips resulted in unsolicited testimonials from past guests who were effectively selling the trip to other prospective travelers on our behalf. Posts like this drive engagement among travelers in a setting we can monitor. In the end, this sets the stage for positive third-party endorsements of our trips, generates qualified traffic to our websites and results in conversion to bookings. Our regional operations managers are given a great deal of autonomy, and it is in large part through their success at fostering good communication and support for their employees that we’re able to succeed as an organization. We also maintain a guide blog where we post daily news and information that we think will be of interest, including policy documents, guest feedback, regional interpretive resources, photos and videos. We distribute business cards that guides can pass out to their guests, encouraging them to evaluate their trips, and we reward guides who get good feedbacks from their passengers. Many of our employees also feel positively connected to our commitment to run the most eco-friendly trips possible. And we provide special benefits to them in the form of complimentary or greatly reduced-priced outdoor gear. It is easy to maintain a passion for rafting when I get out on the river periodically. There are still lots of great rivers to explore and the beauty of our western rivers captivates me. Of course, each trip also has its own human dynamic, with different passengers who make each trip special. I just got back from a trip to southeastern Utah, where I floated on the Escalante River that I had never previously rafted. I hope to do many more exploratory trips that I can then share with our clients. OARS did see a drop in business in 2009 and 2010, but the outdoor experiences that we offer are still sought out by many people during economic contractions. In fact, during all of the earlier recessions that we experienced during our first 30 years in business, our passenger numbers actually increased. During this recent big economic downturn, we have made major efforts to figure out the most efficient, cost-saving methods of operating our business. For example, we have shifted more to online reservations and we have transitioned from paper trip confirmations to electronic communications for most of our trips. We also have focused a much greater effort toward organic search engine optimization and online marketing so that potential customers can easily find us when they start planning their rafting vacation. The biggest thing that UCLA did for me was to introduce me to a new activity that I probably never otherwise would have experienced. For me, the Bruin Mountaineers trips on the Colorado River that was organized by one of its members turned out to be a life-changing event. I also met a number of wonderful people at UCLA, including one great engineering professor who taught me a lot about organizing activities. In my senior year, I was elected president of the Bruin Mountaineers, and this job put me in contact with university administrators who helped me learn about working efficiently within a big organization. I would recommend seeking out and talking with a number of other people who are already doing something similar to what you are interested in pursuing. Entrepreneurs are normally very happy to share details about their experiences with others. Networking can be a valuable way of getting information regarding market trends, and many communities or chambers of commerce provide valuable mixer opportunities. I also recommend talking with several bankers to find out how receptive they might be to loaning start-up funds. For many people, the best thing about being an entrepreneur is the freedom to be one’s own boss and make one’s own decisions. The downside, of course, is that this freedom also provides a tremendous amount of opportunity to fail. For example, if a bank will loan money to a small business, the owner generally has to personally guarantee the loan’s repayment. Another downside is that most small business owners work long hours to get their business established. For me, however, the benefits of running our own family company have far exceeded the drawbacks.